The Seahawks get a 17-7 win over the 49ers to hand them their first 3-game losing streak of the Harbaugh era and officially eliminate San Francisco from playoff contention. 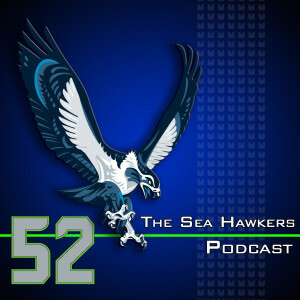 The guys talk about some of the unusual things that happened during the game that Seahawks fans aren’t used to seeing with this team. Seattle’s defense continues to be a topic of discussion as Jordan Hill has been a pleasant surprise and Bobby Wagner just seems to get better every week. The Seahawks go on the road to face another great defense, but can the Cardinals find a way to win with a quarterback who has one career win and no career touchdowns? This week the Sea Hawkers Podcast brings on a pair of our favorite Seahawks historians in Ramona Peel and Mark Tye Turner. Ramona, blogger on Dave Krieg’s Strike Beard, compares the 49ers downfall to the Soviet Union and the end of the Cold War while Mark talks about how this Seattle defense is the best since the 80s era defense coach by Chuck Knox. Both talk about their reactions to the win over the 49ers and Ramona talks about how it just wouldn’t be the same without Jim Harbaugh on the sideline and mentions the fluid nature of Seahawks rivals since joining the NFC West, while it wasn’t always the case in the AFC. The Chicago Bears and Cincinnati Bengals are two teams on target for “Do Better” this week and Adam calls out a listener and the Buffalo Bills for “Better at Life” while Brandan shares his appreciation for a Seahawks offensive tandem.